While defending Henry Kissinger during a dramatic protest during a Senate hearing on Thursday, Sen. John McCain (R-Ariz.) called those speaking out against the former Secretary of State as “low-life scum” as they were escorted from the hearing room by Capitol Police. Kissinger served under President Nixon and is widely reviled by human rights advocates for his involvement in orchestrating the Vietnam War and defending U.S. foreign policy, including various atrocities, across the planet for more than half a century. Members of the peace group CODEPINK took the opportunity of Kissinger’s testimony before the Senate Arms Service Committee to confront the man they call a “war criminal” as they attempted to serve him with a ‘Citizen’s Arrest Warrant.’ Holding a banner and dangling handcuffs in front of a stoic Kissinger, the protesters declared him a “war criminal” who should be arrested and prosecuted for numerous offenses. 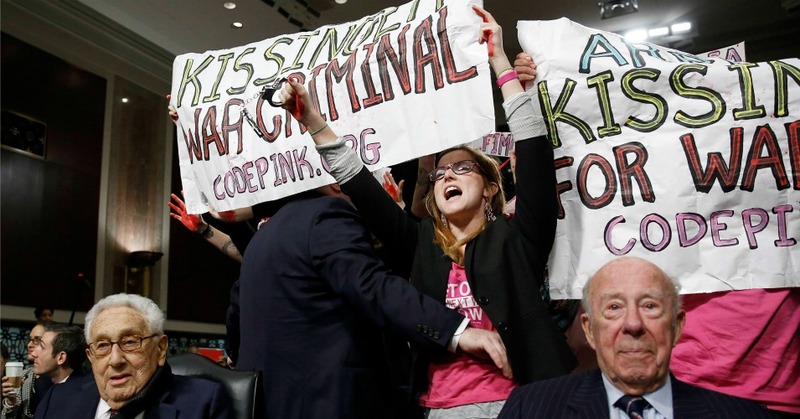 Protesters from the group Code Pink chanted, “Arrest Henry Kissinger for war crimes!” and raised signs in the air as Kissinger entered the Senate Armed Services Committee hearing room. McCain’s incredulous response did nothing to dissuade the peace activists from their position that Kissinger is a criminal who belongs in prison, not an elder dignitary deserving of praise. In addition to Kissinger, CODEPINK’s national coordinator Allie McCracken singled out former Secretary of State Madeline Albright, also testifying before the committee, for her role in past crimes of U.S. foreign policy. Vietnam: From 1969 through 1973, Kissinger, working for Richard Nixon, oversaw the slaughter in Vietnam, Cambodia and Laos, which led to the deaths of millions of people. Many thousands more died from the affects of massive doses of Agent Orange and from unexploded US bombs that cover the countryside. Chile: Henry Kissinger was one of the principle architects of the coup in Chile on September 11, 1973, a coup that overthrew the democratically elected government of Salvador Allende. Sixteen years of repression, torture and death followed under the rule of Kissinger’s friend, the fascist Augusto Pinochet. East Timor: In 1975, while working for President Gerald Ford, Kissinger pre-approved the Indonesian dictator Suharto’s bloody invasion of the small island of East Timor. This illegal act of aggression was carried out with weapons furnished by the US. By the time the Indonesian occupation finally ended in 1999, 200,000 Timorese – 30 percent of the population – had been wiped out. This is Kissinger’s legacy. Death. Destruction. Suffering. Misery. Dictatorships. His is a murderer, a liar, a crook, a thug. Democracies should hold their officials accountable for their acts. That’s why we demand that Kissinger be arrested for crimes against humanity and tried at the Hague. This work is licensed under a Creative Commons Attribution-Share Alike 3.0 License. Click here to follow more news and reports from Common Dreams. For more information about the life and crimes of Henry Kissinger, watch the superlative Christopher Hitchens-inspired documentary The Trial of Henry Kissinger. Reblogged this on Redvince's Weblog. Not to defend Kissinger, but doesn’t anybody else wonder why make an issue of him, out of all the war criminals running around in our political system, now? Or why Code Pink, a “social justice movement working to end U.S.-funded wars” has nothing to say about the events in Ukraine, a coup sponsored and supported by the US? Some interesting points, Rostale. You clearly do a fine job as a very courageous devil’s advocate. Personally speaking, the problem I have with Kissinger is a) the inordinate number of deaths he is responisble for (especially in Latin America, a region I am particularly close to and interested in); b) the way he continues to be celebrated by the Western establishment despite demands for his arrest and trial on war crimes from many different legal jurisdictions; 3) his continued influence over Western foreign policy, which cannot be ignored. As you state, on the issue of the Ukraine conflict he has advocated much greater restraint, which, if true, should be commended (although by and large the weasle words of Henry Kissinger should be taken with a pinch of salt — if you don’t believe me, watch the superlative documentary The Trial of Henry Kissinger; link provided at the end of the blog post). That said, all the evil that Kissinger has committed in the name of US real politik and the hard time he is now finally being given for it does not in any way excuse the way the U.S. liberal establishment turns a blind eye to the wretched crimes of supposedly more leftist figures like Soros and Brzezinski. And finally, cheers for commenting!